The official death toll of Canacona building collapse mishap reached 30 with four more dead bodies of workers form Jharkhand recovered today. However, four dead bodies are lying in the morgue, not identified till date. South Goa Collector Venacio Furtado said there could be four to five more bodies inside the debris as per the number they could gather, who were working in the building. 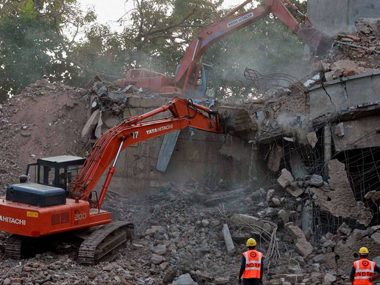 The five-storeyed building of Ruby Residency had collapsed like a pack of cards on 4 January. The rescue teams including fire brigade, military personnel and Pune-based Disaster Manager Rescue Group could save lives of 22 workers. The rescue work gained momentum since yesterday after vibration-free machine was brought from Pune. The dead bodies recovered today are identified as Ramnath Goswami, Dinesh Goswami, Gopal Goswami and Laxman Baxi. While four dead bodies are still not identified, Purso Velip of Barshem (Goa) is still missing. The rescue teams also found two haversacks with their identity cards in the debris, which also had cash in thousands, perhaps the salary these workers had collected. These two workers are still not found. Meanwhile, the rescue team demolished one villa next to the collapsed building for making way to the machine to enter inside. The villa belongs to Subhash Popat, an Ahmadabad-based NRI, who had moved in last month. He was told to clear all his belongings, which he did, but could not take away new airconditoners and other furnished material that went away with demolition. According to Furtado, the rescue work could be completed in next two days. The work was stopped in evening, to be started tomorrow morning. The hypocarates(Hemant Gracias/Kenkro) who are part of criminal nexus Builders/Politicians took candle light procession.Today there is one more protest by a corrupt counciler Simon Rebello.The way things are going it is now clear that the Government is making every efforts to protect the builder,concractor,politicians and bureacrates.Tragic death of labourers means nothing,there is no value for hard working labourers once died.I can also tell there would be not a single conviction in the court with regards to this man-made tragedy.